$100 non-refundable deposit is due at registration. Full payment is due one month prior to camp. The Form Your Own Camp Camp! Camp Description: This unique camp concept has been one of our most popular. Many past camps were so much fun they continued on as weekly sessions. Invite five or more friends to form a camp and we will facilitate a fun filled program, customized to your group.We have done everything from Rock Bands to specific instrument introduction to Music Games! Call Steve Oz to share ideas and discuss details! Camp Description:Singer-songwriter and mindfulness practitioner Joe Reilly invites elementary school-aged children to get in touch with their creative voices, water seeds of happiness, and express themselves through singing and songwriting in this fun and unique camp. Joe shares methods of calming, listening, and cultivating awareness through simple and accessible mindfulness practices that introduce students to his songwriting process. Creative brainstorming and song development are modeled together in the group so that students can continue to write songs on their own. Students are encouraged to share their songs through performances and an in-camp recording session. Joe Reilly, LMSW is a singer, songwriter, social worker, and mindfulness practitioner who has decades of experience sharing music with children in ways that are fun, insightful, empowering, and educational. Find his music online at www.joereilly.org. Meet the Band and Orchestra Instruments! Camp Description: Choosing an instrument in 5th grade can be life changing! By August all AAPS 5th graders are loaned 1 of the 3 instruments they choose free of charge! Before choosing those instruments, your child deserves significantly more hands-on playing experiences than currently provided. ​Oz's Music Faculty is here to help! Camp Description: Camp participants will create a band image, learn popular songs, and have the option to compose an original song. Bands include vocals, drums, guitars, bass, keyboard, and occasionally other instruments. On the final day, the band will perform for family and friends on the Oz’s music stage! Please contact either Dave if you have concerns about skill level. Beginners are welcome! 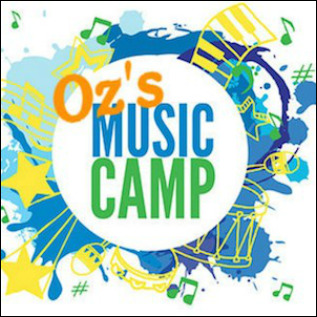 Camp Description: In this camp the Oz’s Music teachers will explore various aspects of folk music with the children. In addition, special guests, the Gemini brothers, will join the camp teachers for one hour of three days of the camp, and will teach the children a number of their award–winning original songs as well as some traditional folk songs. Gemini will work with the children to add hand motions, harmonies, and folk instruments to the songs. If any of the children already know recorder, guitar or any other instrument when they come into the camp, Gemini and the Oz’s Music teachers will incorporate them into the songs. At the end of the week the children will join Gemini in a performance of the songs they learned during the camp. Camp Description: Washtenaw County has a new interactive therapeutic music camp this summer to serve children and adults who have a range of special needs. • A five-day, hands-on music learning environment with structured jams focusing on vocals, instruments and drum circles. Musical experience is NOT required, instruments are supplied, and parents and caregivers can participate. • Daily activities at the Ann Arbor Academy located on Oak Valley Dr. in Ann Arbor. • Experienced instructors from the local music community in partnership with staff and certified music therapists from Eastern Michigan University’s Music Therapy Department. Camp Description: A fun hands-on introduction to many different types of instruments, music fundamentals, games and group jamming! Enables your child to gain experience and excel in music and help them to choose from various musical instruments one that is best for them. Campers who already play will gain more experience and this is also a great opportunity for incoming 5th grade Band & Orchestra students trying to choose an instrument for fall. Camp Description: Every region has it's own rhythmic history and traditions. We'll explore the rhythms of West Africa, Brazil, Cuba, India and the Middle East. There will be daily jam sessions, where we'll apply our new rhythms in a fun, improvisational setting. Bring your own hand drum or use the ones provided! Learn to play 3 famous bluegrass fiddle tunes, as well as harmony parts, improvisation, and fiddle techniques. Try a mandolin as well! Perform at the end of the week as a bluegrass band! Ability to read music not necessary. Students will create a real music video, featuring themselves singing and playing instruments. Learn the basics of camera angles, three point lighting, different kinds of lenses, and editing using special effects. Audio recording methods and an introduction to Pro Tools software will be offered, as well as Final Cut and Adobe After Effects. Camp Description: One of the most popular instruments around is the ukulele! Kids are learning at school or on their own. This camp will teach kids all the fun they can have with this unique and portable instrument. From learning common chords to favorite hits! This camp is sure to be a blast! Camp Description: Learning about guitar basics and being able to play your favorite tunes is what this camp is all about. Let Oz's help you find your guitar style and the joy of playing, whether you are a beginner or have some of the basics down. Our staff will help you expand your guitar skills in a week of musical exploration and fun.